January 22, 2016 – Englewood Hospital and Medical Center has named Mary Ann Donohue-Ryan, PhD, RN, APN, NEA-BC, as its new chief nursing officer. 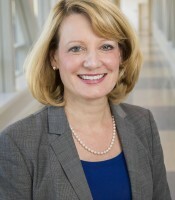 In this role, Dr. Donohue-Ryan will oversee the nursing department and its patient care services and operations, including working with physician leaders, hospital leadership, and the entire nursing team to enhance clinical performance, quality and safety, patient-centered care, and the patient experience. She most recently served as the chief patient care services officer at Stony Brook University Hospital on Long Island and has held nursing leadership positions at Jersey Shore University Medical Center, Clara Maass Medical Center, and Hackensack University Medical Center. Dr. Donohue-Ryan is a former president of the New Jersey State Nurses Association and has consulted nationally and internationally for the American Nurses Credentialing Center’s Magnet Recognition Program®. She received her nursing diploma from St. Francis Hospital School of Nursing, bachelor of science in nursing from Jersey City State College, master of arts in nursing from New York University, doctorate in nursing from Adelphi University, and nurse practitioner certificate from Columbia University.